The temperature here is dropping as I write. Snow flurries and high winds blew in last night, but today’s snowfall is almost an afterthought, with patches of brilliant blue sky behind ominous clouds. 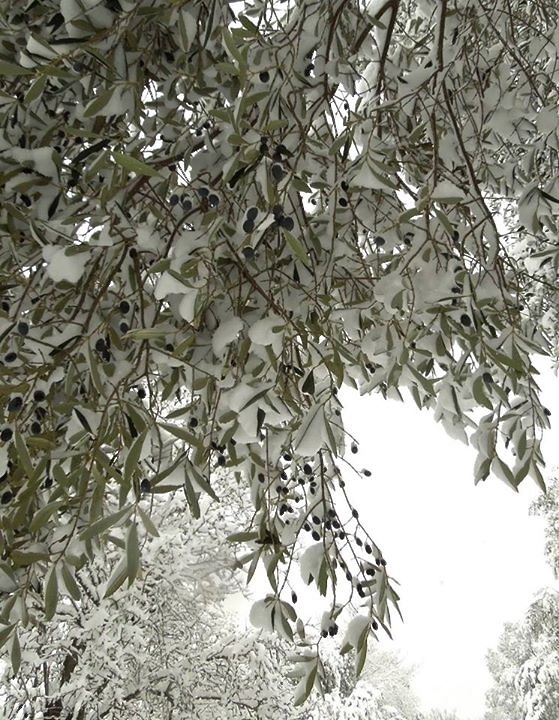 Maybe it’s counter-intuitive, but we welcome the chill if it will lay waste to the olive fly larvae that burrow in the soil of our olive grove. There’s little else to do but stay inside and cook while entertaining visions of insect death and destruction, hoping the incongruity of these two activities doesn’t indicate something troubling about my state of mind. Our most recent haul from the fruttivendolo (vegetable vendor) across the street. All this set us back $10.00. We are well fixed in the pantry for the duration of bad weather. It turns out that Saturday is a brilliant day to visit the greengrocer or the fruit and vegetable market here, especially around noon, to find fantastic bargains on what is already an incredibly affordable array of ingredients. Since everything is closed on Sunday, vendors are anxious to divest themselves of their inventory, so unbelievable deals are the order of the day. Knowing that the storm was on its way, we went a little nutty, loading up on just about everything to hunker down for a prolonged siege. So now I’m knee-deep in winter greens, a not unhappy proposition. As the snow danced around us outside our windows, I dove into the hoard with a plan. 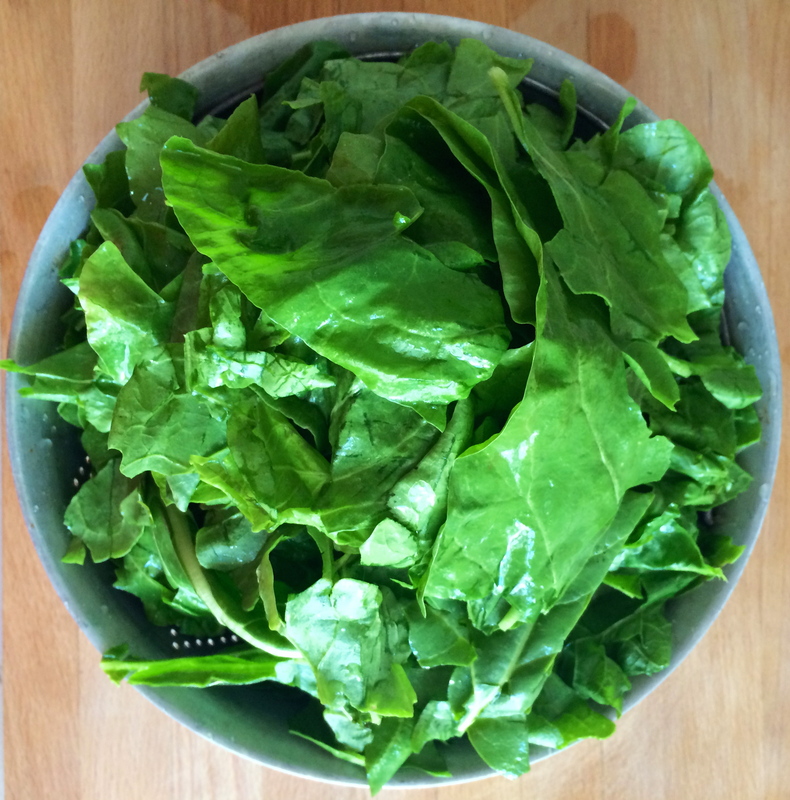 This Swiss chard, with its lush, deep green leaves and pale, thick stalks, spoke to me on such a cold, gray day. Stormy weather invites greater complexity in the kitchen. After all, what else is there to do? Maybe it’s a primal urge to stock up, to fortify, in the face of an uncertain future. Or perhaps it’s because we have so little control over the weather. It’s all we can do to feed ourselves and hope for the best. 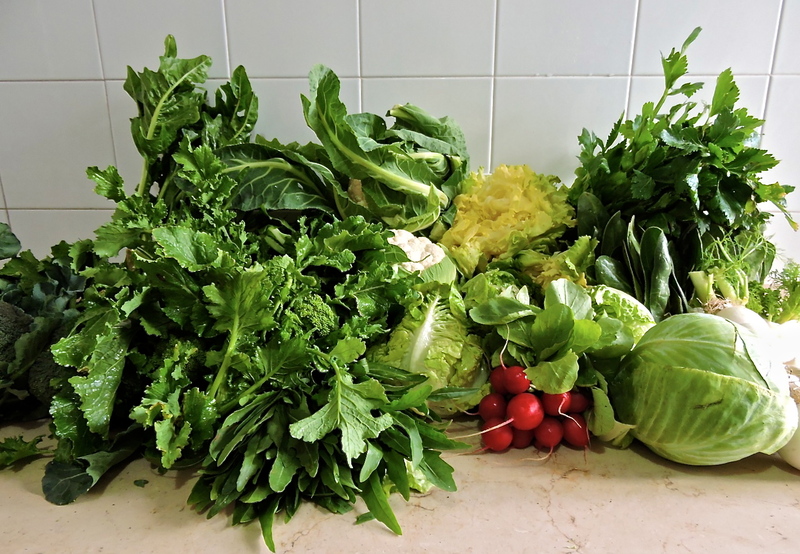 I decided to do something a little finicky with the emerald green bundles of Swiss chard our neighborhood fruttivendolo (fruit and vegetable seller) thrust upon us on Saturday. 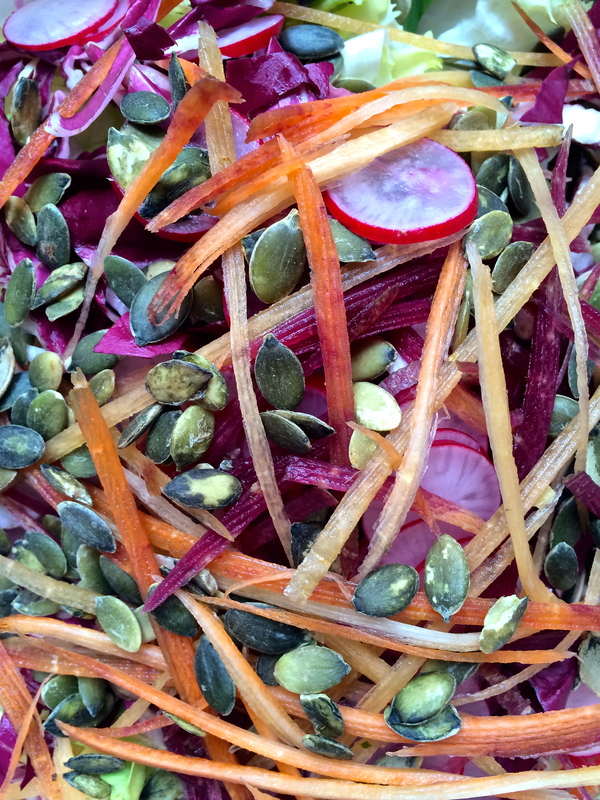 A decidedly un-Pugliese salad (look at those seeds! ), this one nevertheless made us happy while we long for spring. I wanted a deeply satisfying, slightly decadent vegetarian main dish, redeemed by the sheer quantity of greens that make their way into it. The recipe, a gratin from Daniel Boulud by way of Ruth Reichl’s Gourmet Cookbook, is not inherently Pugliese, but when the butter is substituted with extra virgin olive oil, it would be at home on any table around here. And it’s the perfect gateway dish for anyone on the fence about greens. 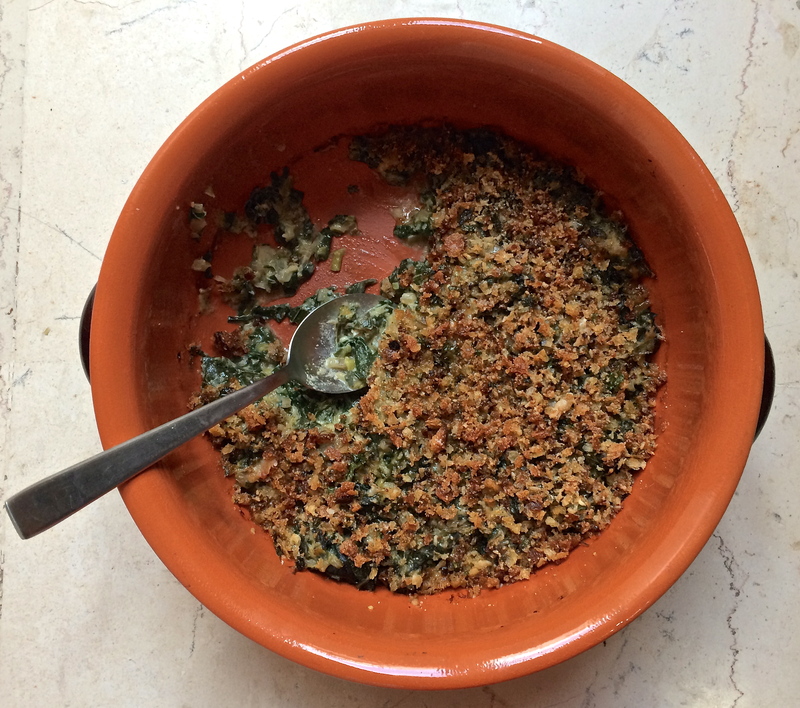 The lush béchamel sauce and crunchy, garlicky bread crumb gratin crust are seductive, serving as delivery vehicles for great forkfuls of Swiss chard, spinach, leeks and onions. I followed the gratin with a colorful salad, incorporating still more of our vegetable trove, feeling both virtuous and sated. Rich and earthy with a crunchy, cheesy crust, this gratin satisfies every mid-winter flavor craving on a cold, dark day. Take the time to execute this gratin. I’m not going to lie. It’s a little time consuming, using more bowls and pans that it ought to, but you will be roundly praised if you persevere. And you can make it in advance up to the baking point, refrigerating it for up to four hours before bringing it to room temperature and placing it in the preheated oven. 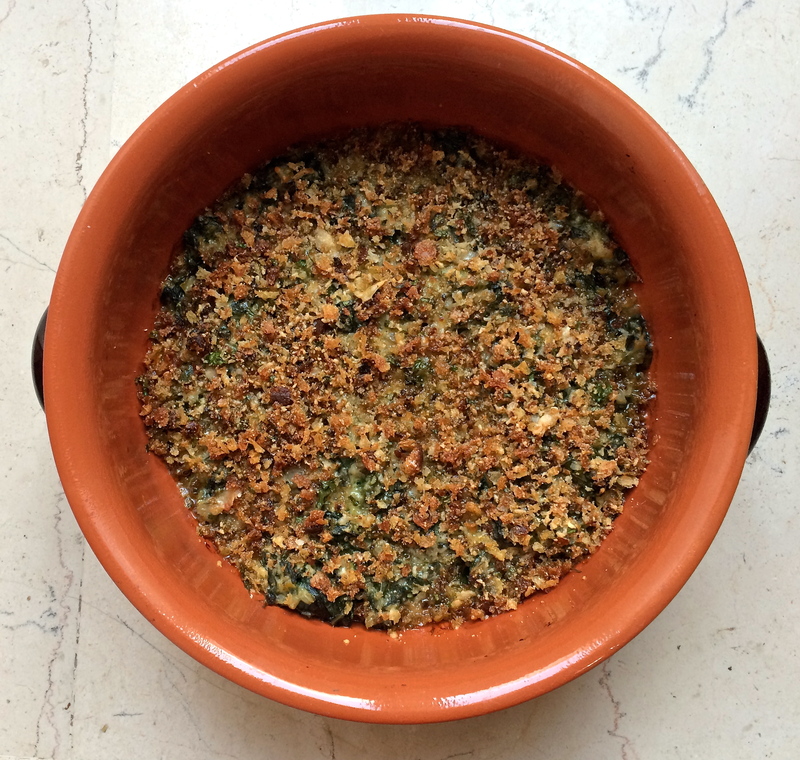 Do think about substituting extra virgin olive oil for the butter in the béchamel and the breadcrumb topping. The result is lighter, perhaps a little less unctuous, but no less satisfying. 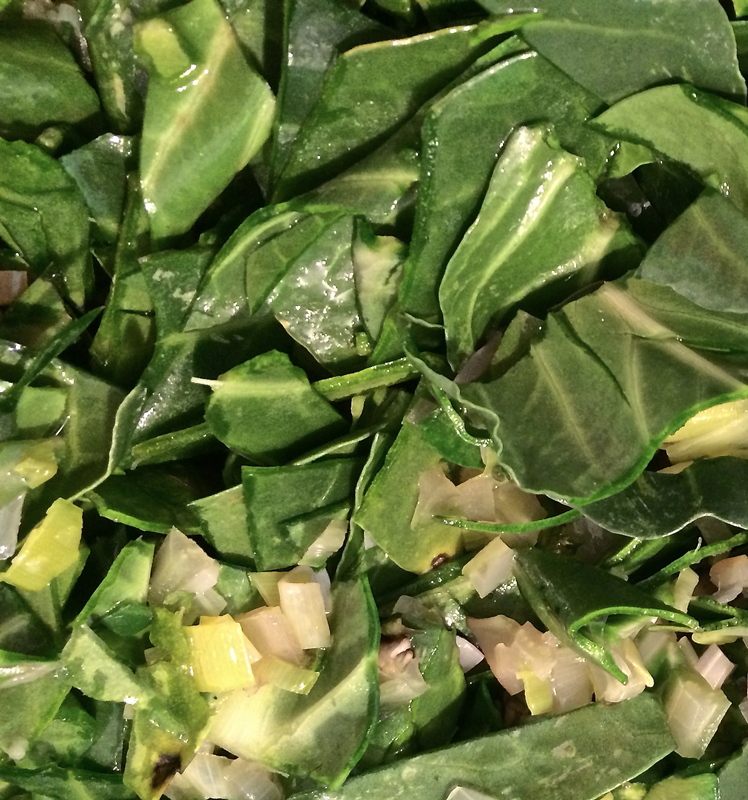 Washed, rinsed and de-stemmed, Swiss chard leaves are ready to add to the sauteed onions, leeks and stems. 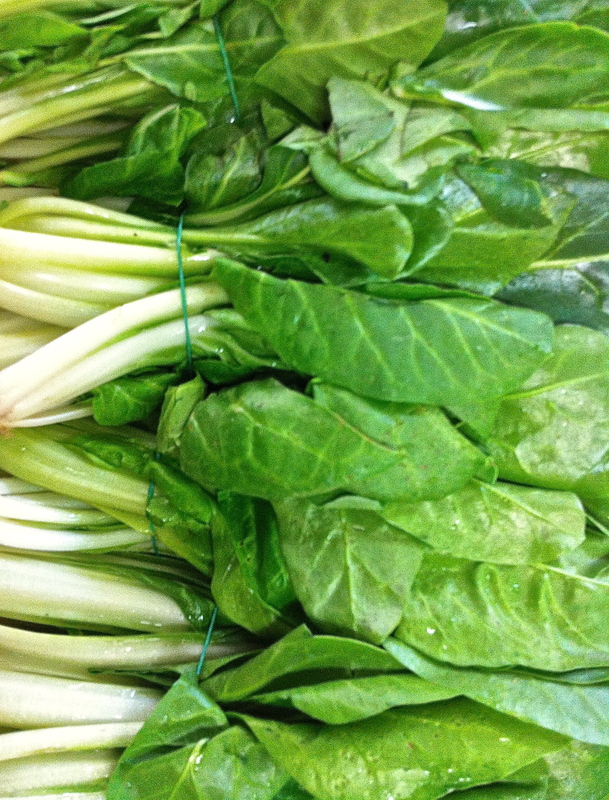 Diced Swiss chard stems are sauteed with onions and leeks to add body and flavor to the gratin. Preheat the oven to 400 degrees F. Butter (or use extra virgin olive oil) to prepare a 12” gratin dish or oval ceramic baker. Toss 2 Tbsp. melted butter (or extra virgin olive oil), with breadcrumbs, cheese, garlic, herbs, half of nutmeg and salt and pepper to taste in a bowl. Set aside. Bring the stock to a boil in a small saucepan and boil until reduced by half. Add the cream; remove from heat and cover to keep warm. 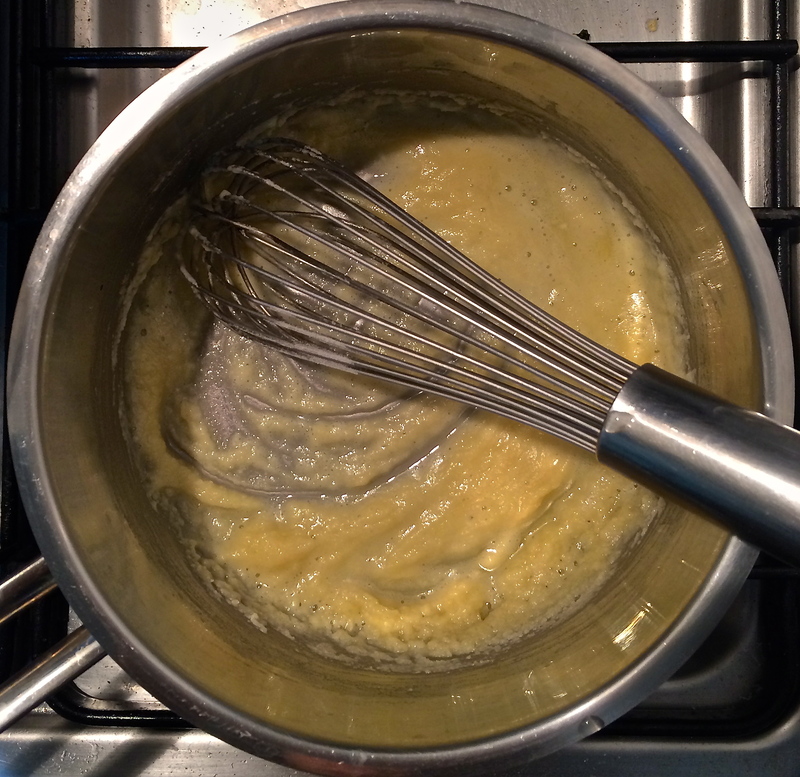 Butter or extra virgin olive oil and flour form the base of the béchamel that binds the gratin. Melt 1 Tbsp. butter (or extra virgin olive oil) in a small heavy saucepan over moderate heat. Add the flour and cook, whisking, for a few minutes to make a roux. Add the stock mixture in a slow, steady stream, whisking, and boil, whisking, for a minute. Season with salt and pepper and remove from the heat. Add the cleaned Swiss chard and spinach leaves to the sauteed onions, leeks and chard stems and saute further until the greens are wilted. Melt the remaining 2 Tbsp. butter (or extra virgin olive oil) in a wide sauté pan over moderately low heat. Add the onion and cook, stirring, until soft. You may need to add a little water to the sauté pan to speed the process, covering the pan as you sauté the onion. Add the leeks; sauté for another 3-4 minutes. Add the diced chard stems, remaining nutmeg, salt and pepper to taste and cook, stirring until chard is tender but not browned. This may take up to 15 minutes. 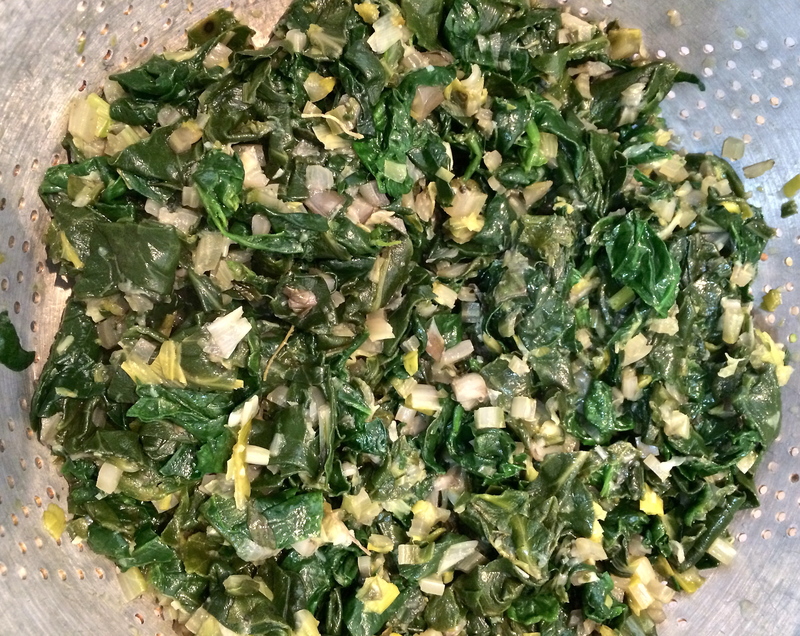 Increase heat to moderately high and add the chard leaves in large handfuls. 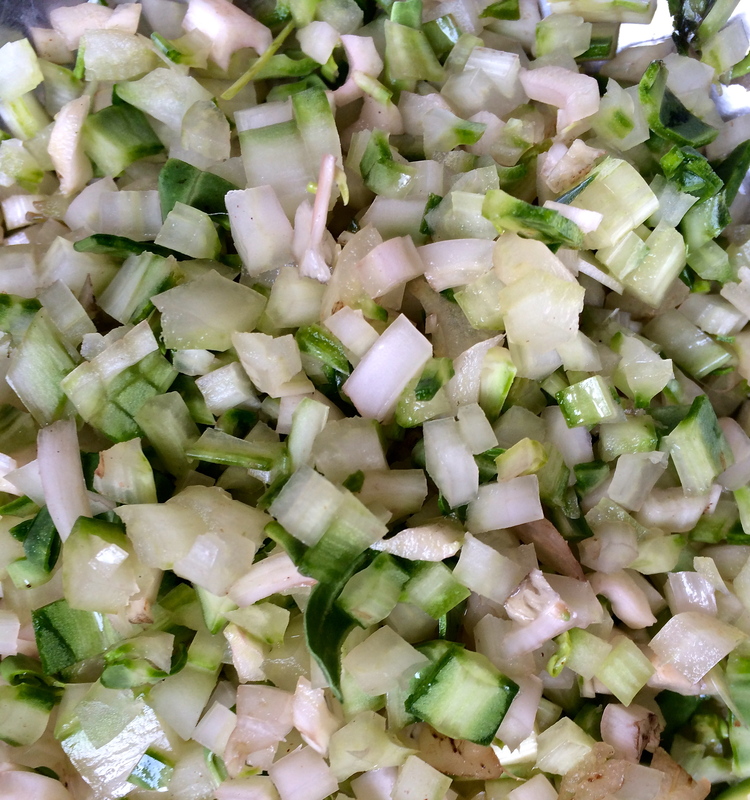 Stir well to incorporate the onion, leek and stem mixture. After about 5 minutes, add the spinach leaves and stir well to incorporate. Sauté the mixture until all of the greens are wilted. Taste for salt and pepper. Once the vegetable mixture is draining in a colander, press all of the liquid out of it to make sure that the finished gratin isn’t soupy. Transfer the vegetables to a colander to drain well, pressing out all of the liquid with the back of a large spoon. Be sure to drain as much liquid as possible from the vegetables so the gratin isn’t watery. Toss the vegetables with the cream sauce (béchamel) and transfer the mixture to the prepared gratin dish, spreading evenly. Top the vegetables with the breadcrumb mixture and bake until the gratin is bubbling and the topping is golden, about 20 minutes. Just out of the oven, Swiss chard gratin is ready to serve. Serves 6 as a side dish or 4 as a vegetarian main course. Sounds and looks so delicious and fresh. Not like the veggies packed in plastic boxes that they sell in the USA.